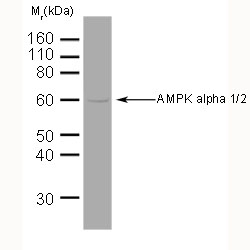 Mouse anti AMPK Alpha 1/2 antibody, clone 34.2 recognises both the alpha 1 and the alpha 2 isoforms of AMP-activated protein kinase (AMPK). AMPK is a highly conserved heterotrimeric protein kinase found in all eukaryotes. The heterotrimeric complex exists as multiple isoforms and consists of a catalytic alpha subunit, which is stabilised by non-catalytic regulatory beta- and gamma- subunits. AMPK plays a vital role in maintaining cellular energy homeostasis and is activated by rising levels of AMP under conditions of hypoxia, ischemia, exercise, low glucose levels. AMPK may play an important role in the control of type 2 diabetes and metabolic syndromes. Recent studies suggest that AMPK functions as a suppressor of cell proliferation of both malignant and normal cells. 29 amino acid peptide within the N-terminal catalytic domain of Drosophila AMPK alpha. MCA2673GA detects a band of approximately 63kDa in rat brain cell lysates.